File image of Hillary Clinton. 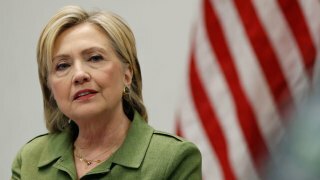 Democratic candidate and presidential hopeful Hillary Clinton is returning to the Bay Area this week for a luncheon event, according to Clinton's website and the Bay Area Democrats Facebook page. The reception, which is expected to sell out quickly, is scheduled to be held sometime on Wednesday in Silicon Valley, according to the Bay Area Democrats Facebook page. The cheapest ticket starts at $1,000, followed by a $2,700 "Champion" ticket, which includes preferred seating. $10,000 "Co-Host" tickets, which allow ticket holders to snap a photo with Clinton, were sold out as of late Sunday morning, but those with $27,000 to spare still have the chance to grab a seat and meet Clinton, according to the candidate's website. Apple CEO Tim Cook along with Lisa Jackson, Apple's Vice President of Environment, Policy and Social Initiatives are set to host the presidential candidate, according to the Bay Area Democrats Facebook page.